Not a secret that eCommerce industry is the fastest-growing and it is oversaturated with robust platforms. HikaShop is one of most powerful and popular Joomla eCommerce plugins with 39,280 live websites according to builtwith stats. Taking this fact into account, we decided to make a thoughtful HikaShop Joomla review and check whether this solution is a worthy competitor to other modern shopping carts. Stay tuned, we’re starting HikaShop inspection! Hikashop is an eCommerce extension that allows you to turn a Joomla-based website into a beautiful and functional online store with ease. This solution quickly became well-known and remains popular due to its user-friendliness, powerful marketing and statistics tools. This Joomla eCommerce plugin allows you to manage custom fields of your store, cope with advanced prices management, translate your content to multiple languages and personalize your store using intuitive interface design. 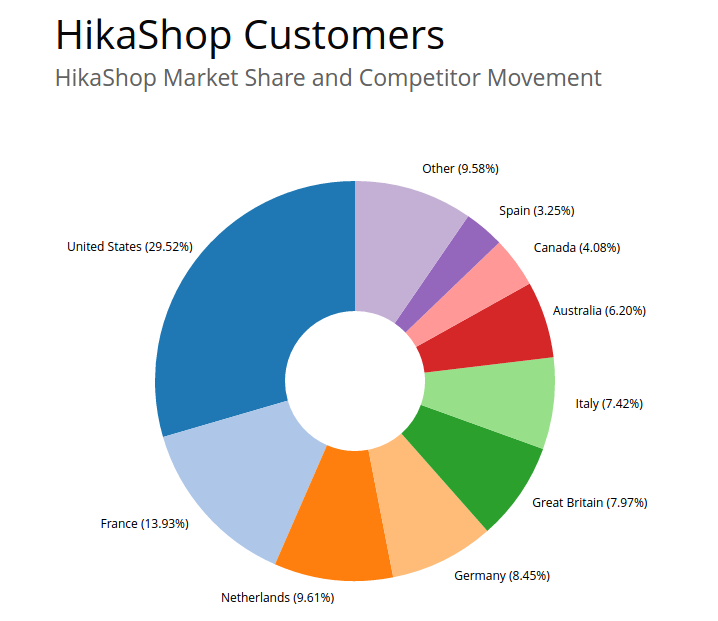 Hikashop is popular over the world, but the biggest rate is from United States according to builtwith statistics. 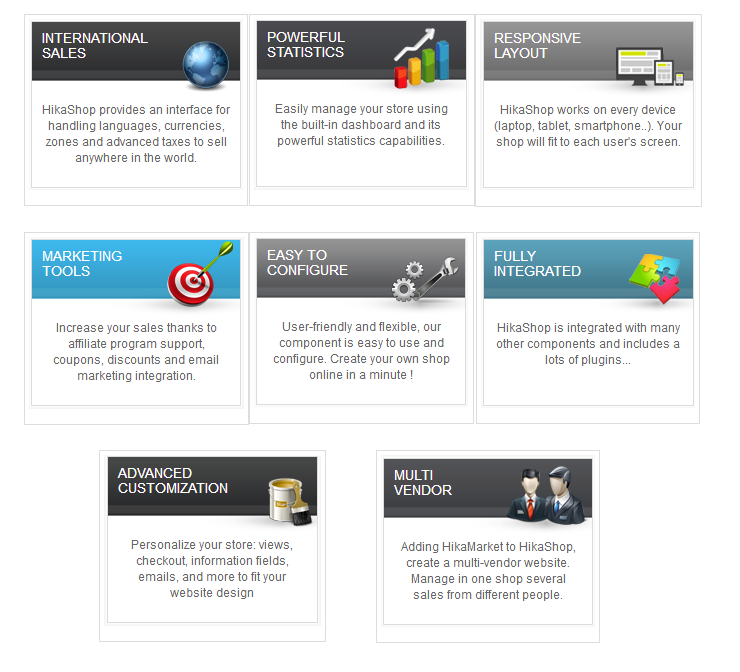 Hikashop offers a variety of tools which include International Sales, Responsive Layout, Powerful Statistics etc. This solution is easy to configure and customize - it gives you the ability to set up your store simultaneously and personalize your store views, information fields, checkout, etc to correspond to your website design. Doing profound HikaShop Joomla review we should mention that this extension is rich on different plugins and integrations to boost your store performance. Manual shipping methods management - this plugin allows you to define your shipping methods manually as well as set prices, logos or even custom restrictions. Alpha User Points - using this plugin, you can enable payments for goods using Points. Customers will pay with their Points and gain them by buying products from your store. Geolocation plugin - this addon allows you to track your customers/orders and learn their location basing on IP addresses. These are few HikaShop plugins. It also has integration with Joomla Search and Social networks (Facebook and Twitter) and powerful SEO extension to grow your online visibility. With HikaShop Joomla eCommerce you can create shipping and payment plugins on your own or any others thanks to platform’s simple API. HikaShop enables you to gather, tweak and use customer data form to suit your needs - it helps to get know your buyers better. This platform is integrated with AcyMailing - most powerful newsletter and marketing component for Joomla eCommerce. You can use it to launch creative marketing campaigns. What’s more, HikaShop has integration with Google Products what enables you to publish products there and can significantly impact on your overall products visibility. HikaShop also enables you to launch Affiliate program and benefit from it. By the way, HikaShop allows you to create discounts or generate coupons and limit their activity according to particular products, categories or areas. And these all comes with powerful dashboard. Using mentioned above efficient marketing and statistic tools, you’ll, definitely, create successful advertising campaigns and collect needed data in a quick and simple way. If you are in search of flexibility and simplicity at the same time - HikaShop is your best fit. Running your store on this solution, you’ll always keep with time, providing your customers with competitive benefits. Let’s consider pricing in our HikaShop review and discover how much you will pay using this solution. Hikashop Joomla eCommerce extension is released in three different editions: HikaShop Starter (free), HikaShop Essential (€49.95) and HikaShop Business (€ 99,90). All plans allow you to add unlimited products to your store. By the way, HikaShop offers users more than 70 payment plugins - you can pay with bank transfers, credit cards, PayPal (Standard and Pro), Authorize.net, CardSave, MoneyBookers, ePay etc. This solution is highly customizable checkout process (workflow and layouts). In HikaShop checkout steps are shortened as possible to grow your store’s order conversions. HikaShop provides users with integrated documentation that explains comprehensively how to manage this Joomla extension. Except it, you are offered profound online papers where you can find needed answers. To those, who don’t want to deal with tons of documents there is a HikaShop forum. Quick-witted developers and experienced users surely have already discussed any issues that may occur - join the community and ask about what bothers you. 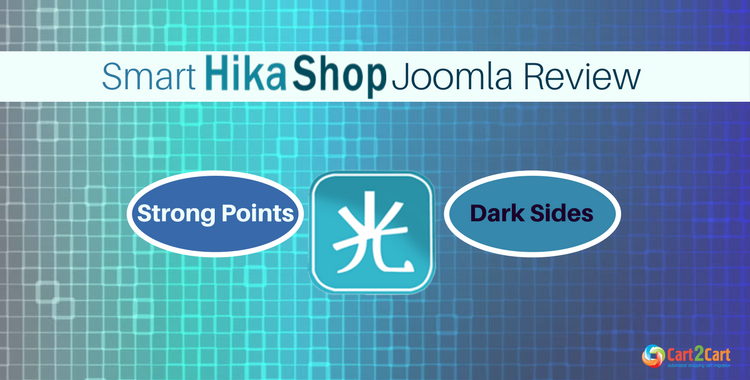 What is important to mention concerning assistance in our HikaShop Joomla review is that you are offered personal support from HikaShop via email within Essential and Business pricing plans. Nothing is perfect and we cannot make a critical HikaShop Joomla review without uncovering “dark” side of this Joomla eCommerce software. HikaShop is both easy to setup and use. Thought, the fact is that it lacks some advanced features that may not be crucial or essential, but able to boom your store performance and take it to a new level. Common store-owner knows how difficult sometimes it is to convert visitors into customers and how much efforts you need to put into this process. That’s why any progressive functionality is never needless. Quite basic set of tools, provided by HikaShop could be one of valuable reasons why merchants export HikaShop to more robust platforms. 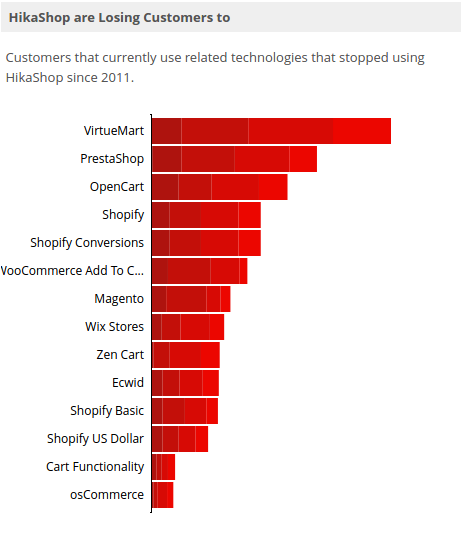 According to builtwith.com statistics most frequently HikaShop is losing customers to VirtueMart (another Joomla eCommerce extension), PrestaShop, OpenCart (check the chart below). This could be also relied with limited design possibilities offered by free HikaShop edition. To get more customization opportunities you need to go with commercial plans. HikaShop deserves to be named one of best Joomla shopping carts. This platform offers effective enough feature-set to develop competitive store. HikaShop is a perfect choice to non-developers or eCommerce newbies who are aimed to run small or medium-sized stores with regular profit and do not need extensive possibilities and high-tech tools. No worries - you will be provided with all of the basics to make a quick and easy eCommerce start. To those to whom this Joomla eCommerce extension looks too simple there is a wide range of other platforms with state-of-art technologies and rich set of progressive tools. At least you can start over from reviewing Top 5 Ecommerce platforms (2017). If you already running your store on particular platform and eager to switch to HikaShop or any other shopping cart - you can try automated migration service Cart2Cart (I bet you’ll easily find yours among 80 supported solutions) This service allows you to check how your store will look on desirable platform by performing FREE demo data migration. What’s great about it? No tech skills are required and 24/7 support is ready to answer any migration-related question. Feeling ready to empower your business and move to most effective eCommerce solution? - Take your chance and start Free Demo!